I spent mine cooking. Now, there’s a surprise! As real as a dish might seem while it is in my head or listed on a menu, I have always felt it doesn’t really come alive until someone else has tasted it. Now that we have tools like Instagram and Facebook, I have the chance to share dishes with a much wider group, more quickly. The challenge here is making the finished photograph match what was in my head, so even if you ‘re not tasting it, I can still make the image lifelike enough to make you feel we’re sharing that plate of food and all your senses are being triggered. No mean feat. I am preparing for my last pop up event of 2015. Details are on the website but, for those who haven’t or are not able to make it to central London, I wanted to give you a little peek into what’s coming up on 8 November and how some of my dishes come together. 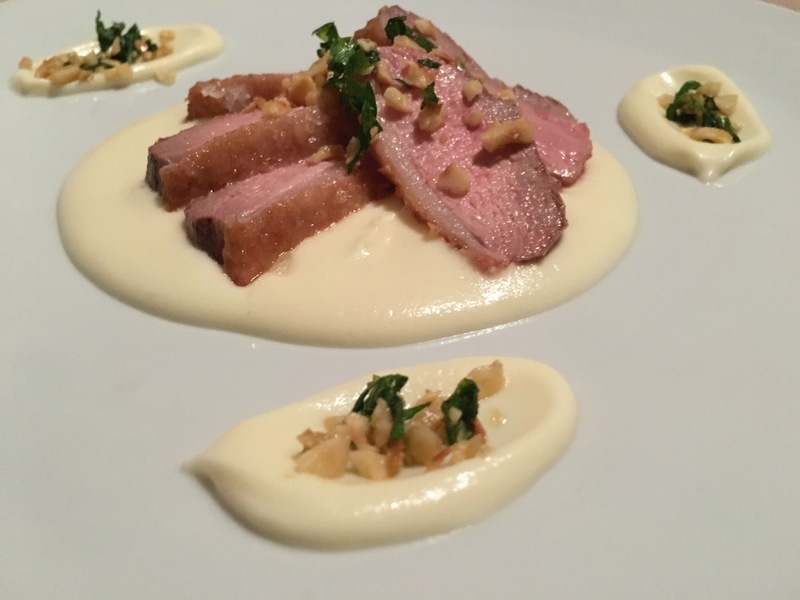 One of the starters is duck breast with a celeriac velouté and a hazelnut and herb crumb. The inspiration for this dish came from a couple of places. Firstly, I wanted to create a duck dish that would not suffer from being served to 30 or more people at the same time. As much as I love duck legs, there is something about a meltingly tender pink duck breast that I find irresistible. This dish started to come together when I was at an awards ceremony in Sheffield. On the menu was a celeriac soup with duck and garlic croutons. It was lovely and reminded me that I don’t use celeriac as much as I should. The duck was shredded and hidden, like treasure, at the bottom on the bowl. The soup was rich and silky but as soon as I tasted the duck, I knew what I wanted to do. For me, I wanted to showcase the duck, so it would be centre stage in my dish; pink, tender and begging to be eaten. I knew that hazelnuts pair well with both duck and celeriac, so a crunchy crumb would rescue the dish from being too soft. Sometimes, simple is the way to go and there is nowhere to hide on a simple white plate. Everything really does have to taste good and everything on the plate has to be there for a reason. Vegetarians have not been forgotten. 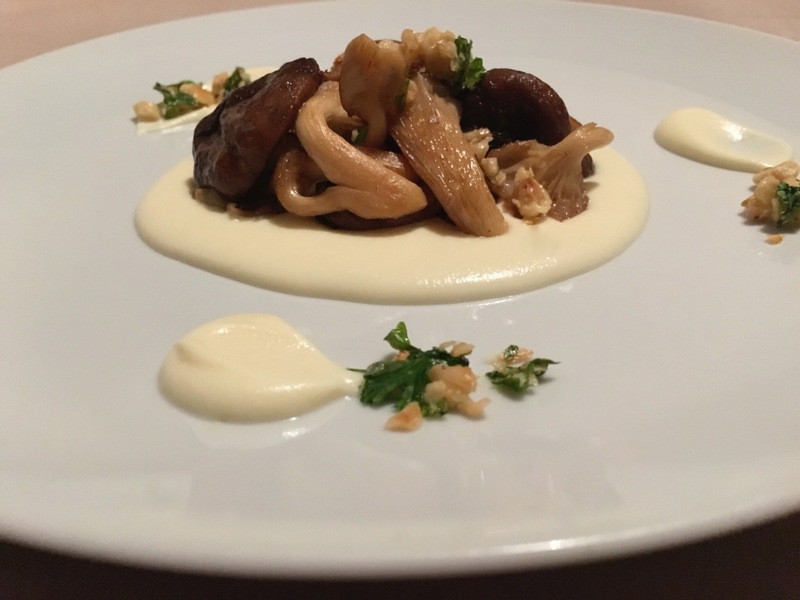 I love working with mushrooms and thought a plate of earthy, wild mushrooms would pair perfectly with the celeriac and hazelnuts as well. One of the lessons I took from my time in Sweden with MasterChef was to get a feel for the food and do what felt natural. This dish came together in just a couple of minutes. I think the mushrooms look great, almost falling over each other, and taste as good as they look. I hope you like the final dishes. If you would like to come for lunch and taste these, and other dishes, you can book tickets on my website.